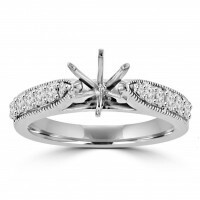 The diamond is the star of the show, but it wouldn’t be able to shine without a perfectly chosen ring mounting. 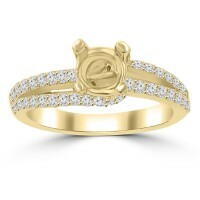 Engagement ring mountings with the signature quality of Madina Jewelry ensure your ring will last a lifetime. Plus, our exceptional handcrafted designs are the perfect foundation to showcase that sparkling stone. Choose from our large selection of semi-mount engagement rings in a wide variety of styles as well as diamond ring mountings perfect for solitaires. 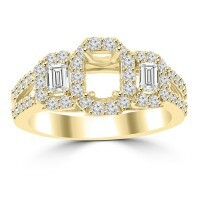 From platinum to gold, we have the wedding ring mountings to suit every taste. 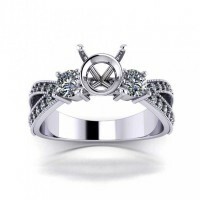 The Prong Set Diamond Semi Mount Ring Set captivates you with a charming diamond of your desir.. 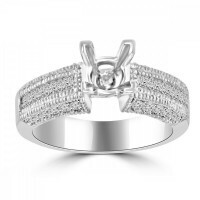 Spectacular and affordable, Madina Jewelry has the right ring for you at the right price. This exqui.. 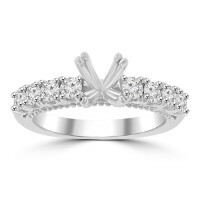 Brilliant pave-set diamonds and milgrain edging dance along the 14K white gold band in this roman.. This stylish setting features round brilliant pave-set diamonds in a round shape, surrounding your c..
A row of sparkling French-set diamonds add brilliance to the band of this classic diamond engagement.. 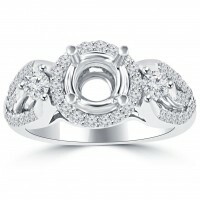 This exceptional setting features a halo of diamond accents that curve gently around the center gem ..